Topshop make-up is one brand I've yet to try. I'm not sure why it's taken me so long to try their brand of cosmetics but so far I'm really impressed. I'm going to share my review of them today! 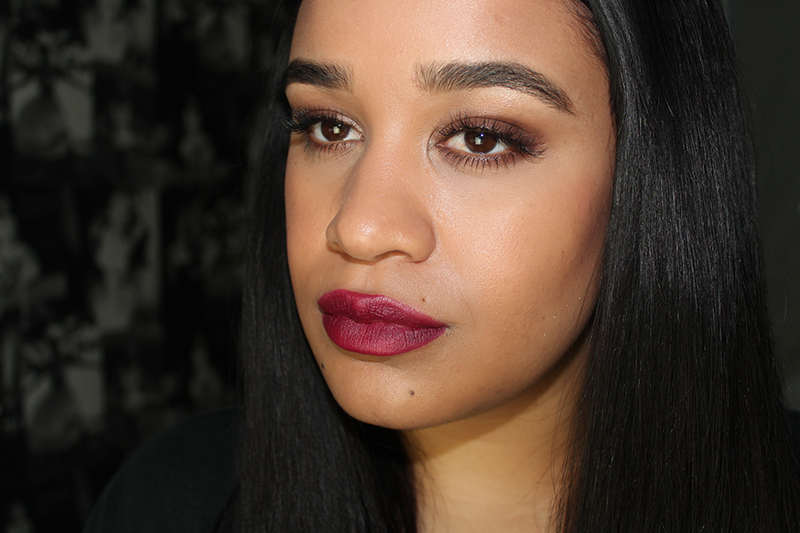 Back with the dark lips for the latter seasoned months. 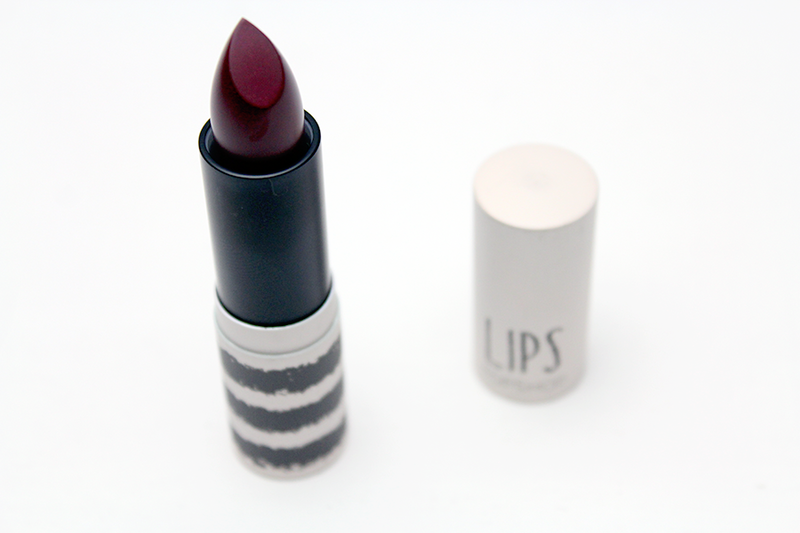 Beguiled is a deep wine colour, satin matte, that glides on beautifully. I love how it feels as if my lips are getting moisture instead of drying out. It has quite a nice lasting on me, shocking. It can give me a good colour (minus eating & drinking) for 4 - 5hrs which for me is a positive. Autumnal colour but would be perfect for those Christmas parties next month. Coral cream blush, has a peach tone but in my images wants to appear pink. It's not. On me this gives a nice subtle tone on my cheeks, nothing to overbearing. Egar beaver me decided to swatch it before the images were taken ( so unlike me ) being so bright, I was a little worried it might be too bright for me. It's not, thank you God. It's a lovely pick me up shade. I would say roughly from when I did my make-up til I took the pictures was a few hours staying power, so nothing too great. Above is a look that I done using them, I wanted to keep it simple, eye and lips as the focus. Have you tried Topshop MakeUp? If not, does the brand interest you? This colour looks stunning on you! I've thought about trying this lipstick but I'm really pale so not sure it would suit me. Great make up! lovin that lipstick shade! oooh that oxblood colour is gorgeous. I've never used anything from Topshop before either - I think it's because I can't be bothered to go all the way to central london just to look at the makeup. Meh! That colour really suits you! I love the Topshop lipsticks, I have Mischief which is a bright red but I need to try another! 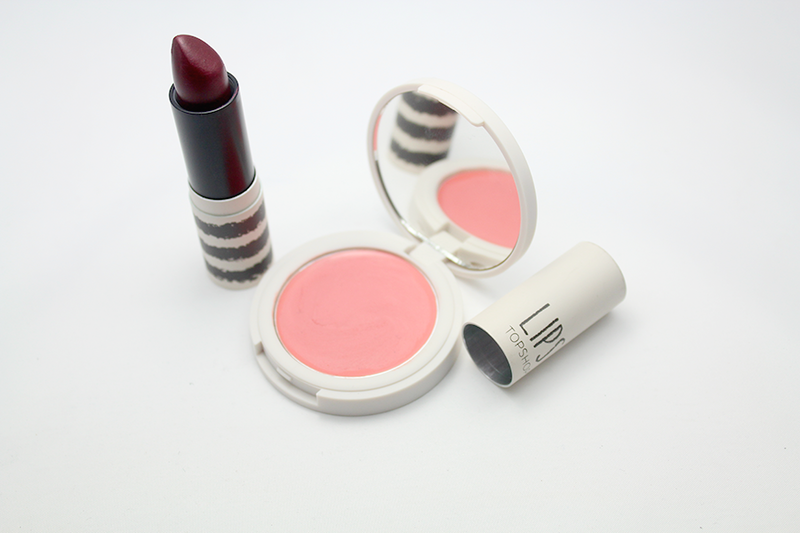 I've never tried the cream blushes but the Lipsticks are such good quality. Can I just ask, when you take pictures like this, what do you use for your background?